It Kicks Like A Mule! "It kicks like a mule!" was pretty much my initial thought as I tried a Siberia -80 Degrees Extremely White Dry portion and the portion bag was slowly being moistened under my lip, releasing the shockingly strong nicotine contents like, well, a mule kick! Don't feel completely put off by this however because I am no strong snuser and for those of us that are well, human, there are less dramatic options if you want to experience the absolutely delicious flavours of a Siberia snus! The -80 Degrees White Portion has only(!) 24mg/g for example which is not entirely unlike a regular extra strong product. Oh, but the flavour – absolutely worth being kicked by a mule for. Any snuser can vouch for the importance of a great pouch bag, after-all, you will be spending a lot of time with it under your top lip. The Siberia products that are Original Portion have a well-balanced moisture level without being neither too drenched nor too dry. The White Portion products are dry enough to minimize dripping and prolong flavour release, but moist enough to feel pleasant under the lip – a job that is definitely easier said than done! GN Tobacco sure are the pillars behind many great products and below is a little summary about their most popular ones. Enjoy! Oden’s: Oden's products are very dear to us, for one it was the first ever brand to be released in such an ultra strong format (back in 2011), but it also is quite unique as far as original portion snus goes with its ultra strong nicotine content. Most super strong products are flavoured with mint, which I suppose adds to the effect by burning slightly under the lip and giving you a refreshing feeling that wakes you right up! But not everyone is a fan of mint, some snusers (like myself) enjoy a perfectly balanced tobacco taste. Luckily, we offer Oden's products here Olde Ving: These products are very interesting and quite unconventionally mixed and matched. I mean, they even have a chocolate flavoured snus! Yes, the name is rather strange, the original name (Olde Viking) did ring better but still, GN Tobacco show great diversity with this one. Lenny: Named after the factory manager who personally blended the flavours for this snus. I feel that looking at their cans almost reveals the snuser behind it, a guy in a flannel shirt perhaps? Joking! Girls can wear flannel shirts too. Islay Whiskey: Extremely cool can design and of course, who doesn't like a whiskey flavoured snus? GN Tobacco got their hands rather dirty with this one and were present at every stage of manufacture. 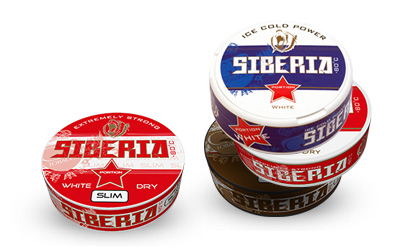 Siberia: This is, of course, a product we are quite proud to offer on our site because it is pure genius both in terms of nicotine strength and flavour. GN tobacco truly flaunt their snus making skills with this one. Taboca: A snus with the traditional Swedish flavour but with a slight modernized take. GN tobbacco make sure to offer products that are both traditional and modern. WOW: This product is all about being different, and the flavours are very interesting and unique. Not really for the traditional snuser but definitely something that can mix things up on a gray day. Obviously, regardless of what type of snuser you are; the traditional type, the slim snusing type, the ultra extra super strong type you will find an option that not only suits you but that you will love in the GN Tobacco assortment. They offer a perfect blend of, well, everything. So the question you should ask yourself really is – which snuser are you?